Almost every country requires a visa to visit them for tourism or for any other purpose. A few others like Maldives, Bhutan, Mauritius and a close to 60 odd countries are comparatively more accessible and Indian tourists are given visa-on-arrival. So, it is only logical that traveling domestically within India would not require a visa or permission from the government. This applies to almost all of the states of India ‘except a few’. There are a few states which require a permit from the government to visit them. This permit is needed by any tourist, be it an Indian or a foreigner. However, in some cases, foreigners are completely denied of visiting certain areas of special category states, even if they have a visa. This is also called an Inner-Line Permit (ILP) or a Protected Area Permit (PAP) or a Restricted Area Permit (RAP). It is mandatorily required by tourists to visit the protected areas of a few states in India. The ILP was a provision made under the Bengal Frontier Provision Act, 1873. It is used by the government to protect the tribal culture in these states by controlling the number of visitors and is useful in restricting travelers from reaching sensitive border areas. Who all need to have this permit? Non-Indian citizens are not allowed to visit certain protected areas in India (mainly North-East) according to the Foreigners (Protected Area) Order 1958. Thus, a Protected Area Permit (PAP) is required to visit the protected areas. Indian citizens who are not resident in these areas are also required to get an Inner Line Permit (ILP) to enter these places. A Restricted Area Permit (RAP) is required by non-Indians to visit the Andaman and Nicobar Islands and parts of the Sikkim. Tawang: Home to the 400-year-old Tawang Monastery, the largest monastery in India and the second largest in the world. To visit any place in Arunachal Pradesh, a permit is required. Some other places to see in Tawang include Gorichen Peak, Sela Pass, and Shungatser Lake. Bomdila: Bomdila offers a panoramic view of the grand eastern Himalayan terrain with its snow-covered mountains. It is famous for its apple orchids and travelers can take a walk through them. It also has a couple of Buddhist monasteries or gompas. Eaglenest Wildlife Sanctuary is also located nearby. Ziro Valley: Located at an altitude of 1500 m above sea level, Ziro is a picturesque town close to 115 Km from the state capital, Itanagar. Due to Ziro’s beauty and the attention it has gathered from the tourists, it is shortlisted as a UNESCO World Heritage Site. The friendly Apatani tribes live in this valley. This place is also famous for the Ziro Music Festival which goes on for 4 consecutive days in the month of September every year. Kohima: “When you go home, tell them of us that for their tomorrow, we gave our today,” reads an epitaph in the War Cemetery of Kohima. Home of the brave and daring, Naga tribes. It has earned its name in history as the place where the Japanese side during World War II was halted. Other places to visit are Catholic Cathedral at Aradura Hill and the Nagaland State Museum. Peren: Peren is the traditional home of the Zeliangrong, and Kuki tribes. Peren is famous for Benreu village and Mt. Pauna village. A tourist village preserved around the ethnic-tourism concept, Benreu is a living showcase of the endangered culture of these highlanders. Mt. Pauna tourist village is an extension of Benreu village (separated from it by about 300 metres) towards the south along the Pauna mountain range. 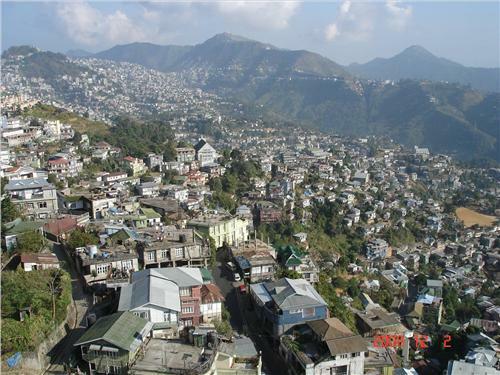 Aizawl: It is the state capital as well as the cultural and the religious capital of the Mizos. Home to the Mizoram State Museum, it is one the most peaceful state capitals of India. Other famous tourist spots in Aizawl are the Durtlang hills, Tamdil Lake and the Vantawang Waterfalls. Kolasib: It has the biggest stretches of plains in Mizoram which are used for rice cultivation.Also, the Myanmarese Hills are easily visible from Kolasib. Pangong Lake: Also known as the PangongTso, it is an endorheic lake situated in the Ladakh ranges of the Himalayas in the state of Jammu and Kashmir. This lake is around 134 km long, extending from India to China. Situated at a height of 4350 m, it is one of the biggest tourist attractions of India. The lake is considered as a wetland and is protected under the international laws and regulations as stated under the Ramsar Convention for Conservation of Wetlands. Havelock Islands: They are situated in the Ritchie’s Archipelago of the Andaman & Nicobar Islands. Due to its rich marine biodiversity, coral reefs, white sand beaches and dense evergreen forests, Havelock Islands are a major tourist destination.